Jul-Shawl Pin - Spun Fibre Arts, a local and online yarn store specializing in natural fibres. Celtic Lion: This light-weight, elegant, and interesting shawl pin was inspired by Celtic illuminated letters using the forms of animals as well as the knots so well-known in Celtic designs. Like all of our pins, the back of this beautiful pin is just as gorgeous as the front, revealing an inscribed version of the low relief motifs on the front. We love the daintiness of the companion stick which may be worn on its own on delicate knits. 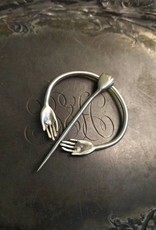 Coil: The Coil Shawl Pin is elegant and sleek, with a timeless design that is at once ancient and contemporary. The ripples in the stick ensure it will hold onto the knitwear, diminishing the possibility that it will get lost as well as allowing it to nest comfortably in the ring of the Coil Shawl Stick it was designed to accompany. The spiral motifs in the coil stick and shawl pin are associated with infinite time, endless movement and boundless energy. Honeybee: This gorgeous penannular brooch combines three of our filigree honeybees, evoking the ways honeybees cluster socially in their hives. It is our way of celebrating the fundamental role pollinators play in the healthy maintenance of plant life on our planet and in our food supply. 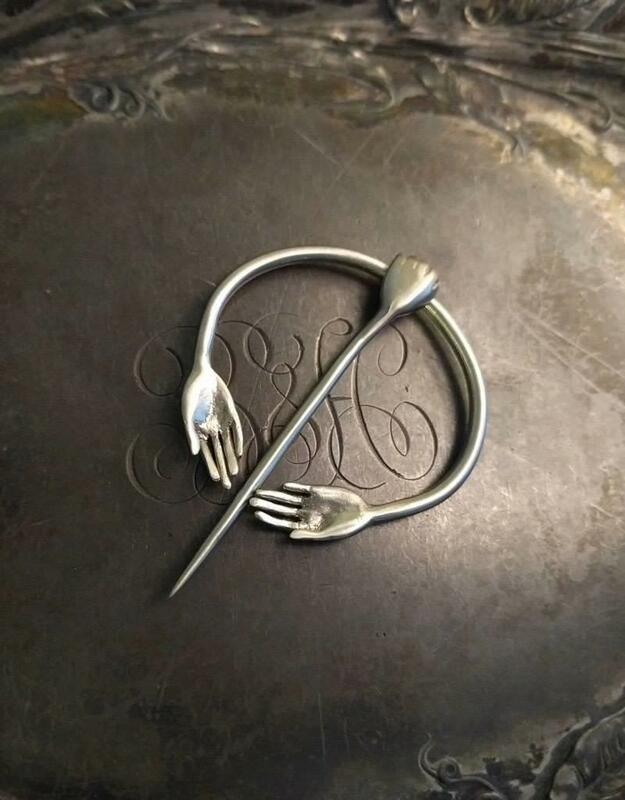 Gesture: The penannular brooch, is often associated with Celtic brooch designs but is a much older shape, emerging in the Iron age and becoming popular in Roman Times. It is obvious why this one-piece design has been a popular brooch style for so very long. The Gesture Brooch is light and delicate, with the same beautiful associations with handwork, generosity and gratitude as its siblings. Ram: Our beautiful Mountain Sheep is now available in this fabulous one-piece shawl pin - the Ram Penannular Brooch. A simple design with an ancient aura, this pin is a stunning addition to your knitwear. Runa: This beautiful penannular brooch was designed for knitwear as an alternative to two-piece shawl pins. Runa is inspired by Norse designs that make liberal use of spiral motifs. In addition, we love the shape of Norse helmets and used aspects of their form to create the stick portion of this pin. Mod: This sleek combination of black leather and highly polished white metal makes for a bold combination. If you want a shawl pin that has simplicity and style, this robust but light shawl pin is perfect for you. The Mod Shawl Pin is gorgeous on neutrals, knock-out on colors, and strong enough to complement hand-paints without disappearing.